Combine 1/2 cup blue cheese in a small bowl with buttermilk, 2 teaspoons vinegar and 1/8 teaspoon pepper; mix well, mashing slightly with a fork. Set aside. Place chicken in another bowl; sprinkle with flour and the remaining 1/8 teaspoon pepper and toss until coated. Heat oil in a large nonstick skillet over medium-high heat until very hot. Add the chicken and cook, turning occasionally, until just cooked through, 6 to 7 minutes. Stir in hot sauce and the remaining 2 teaspoons vinegar and cook, stirring often, until the chicken is coated, about 1 minute. Combine lettuce, carrots, celery and cucumber in a large bowl; add the reserved dressing and toss to coat. 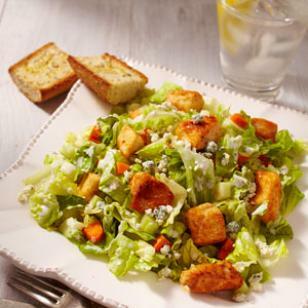 Divide the salad among 4 plates and top each with an equal portion of chicken and 1 tablespoon each of the reserved blue cheese. Per serving: 291 calories; 11 g fat ( 4 g sat , 4 g mono ); 75 mg cholesterol; 15 g carbohydrates; 0 g added sugars; 32 g protein; 5 g fiber; 607 mg sodium; 832 mg potassium. Nutrition Bonus: Vitamin A (350% daily value), Folate (44% dv), Vitamin C (25% dv), Potassium (24% dv).